It is good to know that you got it in. I am 6ft and 250lbs and it was not easy to do. Somehow the space to work in is not for the big guys. I would say you are OK with the sensor resistance But I would like to suggest that you take the time and clean the sensors and connectors to make sure they are not part of the equation. As for the P1111 that is an on-board diagnostic test indication the test has been completed, the opposite is P1000 so for either one do not be concerned. You are driving the car so try to add a fuel additive BG44K to a full tank of fuel and see how you make out. 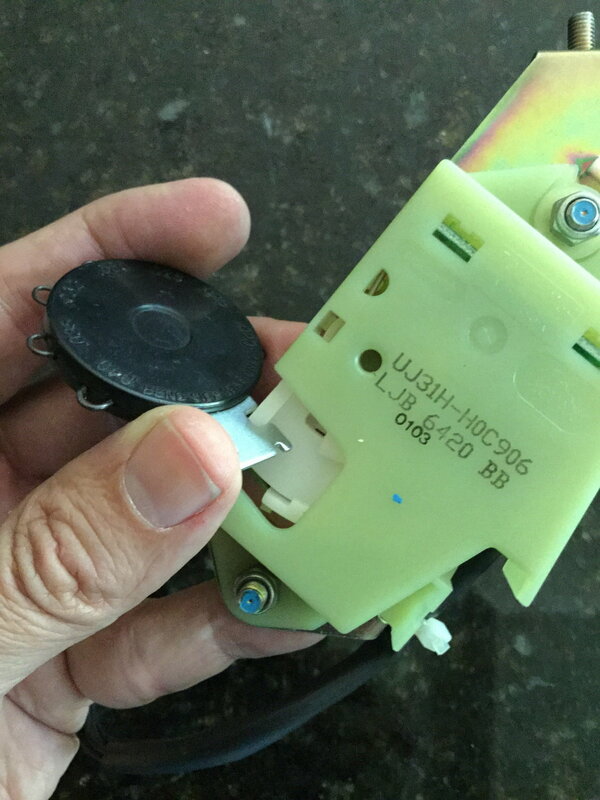 Just replaced the brake light switch on my wife's 2003 XK8. Bought it online for $125.00 because the dealer wanted over $200.00 just for the part. I'm still sore from the cramped working conditions, but have a suggestion for guiding the studs on the switch through the firewall. I had my wife drop a piece of sewing thread on a needle down one of the holes in the firewall. After I tied the thread to one of the studs on the switch, my wife pulled on the thread while I guided the switch into position. This took less than 5 minutes. Complaint: on startup, all is well. Then after a few km of driving, the amber warning dash light comes on with " Cruise not available" and " check rear lights" warning text messages. Correction: dealer visit: " Checked for stored codes . Found P1571. Brake switch fail, order new switch, Removed and replaced faulty switch, clear codes and road test ok"
Dealer fix: PART LJB6420BB. "Switch-brake PE Switch" + two hours Jaguar dealer labour charges plus taxes. Last edited by Boomersaurus; 08-19-2014 at 10:15 AM. DITTO for me. Went to a local shop a few days ago to take care of this and a few other things. I think the total charges for the switch (part plus replacement) came to $376 of which my aftermarket warranty paid $276 (I had $100 deductible). There is not way I can deal with lying upside down in some cramped space to do things like this anymore (not so much a flexibility problem but more it just makes me dizzier than when I did things like this as a kid with previous cars). tried to add the text to my pictures above but it would not allow me to edit the post so the text and pics are all in this one. If it lets me edit later, I will remove post above this one. I worked on this switch install on Friday afternoon. I purchased the rebuilt switch for $25 from John Sullivan who is on this thread. I have not completed the job yet so I will update to confirm the switch from John is working. While the seat was out, I decided to take care of the "dead pedal" foot rest for left foot. I am building it up but I need some special sized bolts that I won't be able to get until Monday so I won't know until then if the error codes concerning rear lights and cruise control have gone away for good. The removal of the seat is pretty straight forward. Just remember to get it raised as high as it will go and then move it all the way forward to get the back T40 fasteners off and then the opposite for the fronts. Raise the steering wheel all the way up and all the way in toward the dash to aid in removing the seat from the car and making room to duck under the steering wheel when getting into position to remove the switch. Disconnect the battery. When the 4 fasteners are off the seat rails, tilt the back of the seat forward, and then tilt both the seat section and back section as a unit (closed clam shell), back toward the back seat...so it's doing a wheelie. I then put some brick supports under the rails to hold the seat in that wheelie position so I could work on disconnecting the wire harness in two places. I don't do much work on cars so I don't deal with these connectors very often and therefore I have to figure out the puzzle each time re: the release points. I'm sure for most of you reading this, these connectors are very straight forward but it always takes me a few minutes to figure out what I should be pushing and what I should be pulling. The wire harness splits off to two different connectors. On the small one, there is a clip that needs to pried open to release the wire harness. On the larger switch, the wire harness is taped to a "T" shaped mount. The tape needs to be cut or unwound. I cut it using a razor putting pressure down in the area where the tape is covering the plastic "T" mount thus minimizing the chance of cutting any wires in the harness. After disconnecting the seat (fasteners and wire harness), remove bricks so seat is flat, then pull seat towards you, (still in closed clam shell form) like you are rolling it sideways out of the car, tilting it out from the highest point on the seat while it rotates/hinges on the left seat rail. Once you get it over between 45 and 70 degrees, you can safely lift it out while rotating the seat package horizontally, as if the backrest of the seat was going to lay flat against the left rear corner panel of the body. This action gets the metal rails away from the paint to minimize the chance of scratching anything and it feels like the most ergonomic way of handling the seat. Now get your 1/4" drive socket set out. Use a short handled ratchet, a deep well 8mm socket, make sure it is locked for unfastening, get your lighting in place and then contort you body to a position with your right arm and hand leading the way, on your right shoulder/back. You can't be flat on your back because your shoulders are too wide and you would never be able to get your arms into position to do anything useful. Pull apart the short connectors on the insulation so it is "more" free to move out of your line of sight and work area. You will see the end of the switch and a "relatively" easy to reach 8mm nut that needs to be removed without dropping it or losing it...not so easy. You will also see a white zip tie near that nut that is holding the wire harness from the switch to the bracket that the switch is mounted to. If you are working with John Sullivan, getting a rebuilt and returning to him the switch you take out, you need to be very careful cutting this zip tie. A razor blade won't work. The best tool for doing this is a small wire cutter/pliers or maybe even a larger finger nail cutter. The zip tie is tight around the wire bundle so you need to be precise. I had the right tool for the job so it worked out ok. The back nut and zip tie came out pretty easy and not much time had ticked off the clock at this point. But, now I had to loosen the nut for the front of the switch just enough to relieve the pressure on it so I could slide it out while leaving the nut on the post. I spent the next hour and half trying to engage that nut with a shallow socket, a deep well socket, the flexible ratchet etc... Not once did I get the tool on to the nut. Even if I had engaged the nut, there was no room to move the handle of the ratchet. I went to the hardware store to buy a ratcheting open end wrench and once again, I was never able to engage the tool on the nut. I was about to give up on removing just the switch and instead remove the bracket holding the switch. If you've read this far, you know that is no fun either. As a last try, I decided to try to lift the rear of the switch off the threaded post and then pull down to see if I could slide the open U-shaped capture on the switch, held tight by the nut, right out from under it. I figured I'd still be "screwed" if this worked because how would I get the new switch back in and even if I did, how would I tighten it down on the front end? Well the dang thing allowed me to torque/bend up the rear and get the switch hole over the mounting post without anything breaking. And then, to even greater surprise, it seemed like it had a lot more play than I expected and maybe it was coming out of the front fastener. Well it wasn't a straight slide out but after lots of wiggling and position changes it came out. Now I could see the front post. It does have a nut on it (I think) but it also has a "stand off" for the U-shaped clip to slide under. I'm not even sure if one can tighten this down?? It's really hard to see in there and very uncomfortable and my state of mind at that point was focused on finishing this job. I got the rebuild switch into position and on the first try it slid in perfectly....pure luck. I thought this part of the job was going to be at least an hour of trial and error but I got lucky on this stage of the job. So it's in, the nut is back on the rear post, the front post and switch seem stable, the connectors are connected and I'll see if all of this was worth it come Monday when I put the seat back in....if I get the other job completed. The remainder of this are some pictures in chronological order that might be useful to someone who is "stretching" themselves to try something a little harder than they would normally do. It shows some of the basics and a lot more detail than is usually given via pictures in these reports. I wrote it for someone at my level who is NO Mechanic and unfamiliar with working in such tight spaces. Hope it helps you out and let me know if the new switch goes on as easily for you as it did for me. Last edited by hardmat; 08-23-2014 at 01:57 AM. OK, I did it. Thanks to all of the people who posted prior to me that made the job easier. Still have to account for the dumbass factor in my case, but after I got past that it all came together. Bought the relay online for $135. Went for the entire bracket replacement method. Getting it out was easy. Getting it back in a little more difficult. First used wire to put through the holes that was too brittle. Changed to thread with melted glue sticks to hold it.. Then figured out I was trying to install it backwards. With that straight and my wife pulling it up while I guided it from below. Was able to leave the seat in, laying on the seat under the steering wheel and simply reach up and feel the holes with my right hand. It went in easy and my wife quickly started the nuts. The rest was easy. That is until I did the test drive. The car would not get out of first gear while in automatic. Manual shifting would work. And cruise control was inop. Thought it might just be some gremlin in the system and pulled the battery connection, no change. Not finding anything online I reached back up to check everything. It requires starting the car and pushing the brake in as much as possible. I used a camera tripod. In feeling the area where the bar on the brake touches the brake relay, I could tell the area where they meet on the relay was not touching properly. It took some effort but I was able to pull the rachet part on the brake relay out to fully extended. Took it fo a drive and every thing worked. I knew from reading posts from others that area had to be fully extended, but somehow in the install it was pushed in. Having the old one there to visualize allowed me to know what I was feeling with my fingers. It was not easy to do while installed. Ended up using an old spark plug gapper to get a grip and pull it out. I checked with the local Jaguar dealer and was quoted $500 as an estimate. So I saved quite a bit doing it myself. Pays for more gas in my plane! Good luck to others, it can be done. Just study well before starting. What I used to pull the rachet connection out. I did the brake switch swap, and it solved the display of check rear brakes etc., but cruise doesn't work and now the brake lights are on all the time. Any ideas. I had the same rear light problem with my 97 XK8. Here is what I did to solve the problem. I can't remember who posted this fix. When replacing the switch it there a way to make it easier in the future? Move to a different location? In 2016 the local Jag dealer wants $250 for part alone. I am having the same fault on my 06 XKR with 75000 miles. I tried a few things so far and nothing fixed the "check rear lights" and "cruse not available" codes. tried spraying WD40 on the brake switch and cycling it 50 or so times to clean the contacts and I tried adding extra grounding wires to the tail lights as suggested else ware. NADA. Ill go ahead and odder the brake light switch. $149 on e-Bay. Did the brake light switch fix yours for good? Spraying WD40 will do no good as the contacts are actually sealed micro-switches. The main reason for the codes is that one of the two becomes intermittent (on an XK8 with cruise, non-cruise models have only one switch) and the ECM then believes the switch is faulty and for safety disables cruise and puts up the brake light error message. 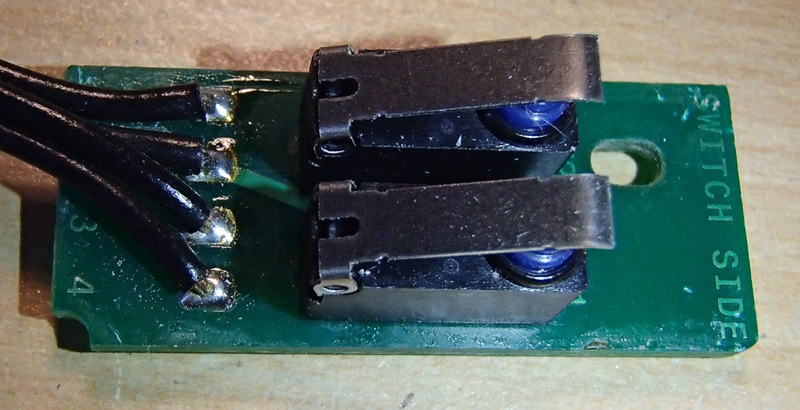 I have done three of these now and the soldering on the switches and where the loom connects have never been the issue although I guess that could happen. I have just completed the last one and tested it today. 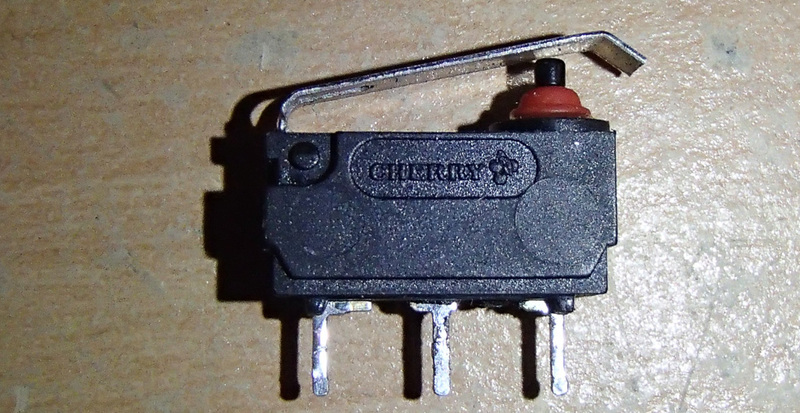 The fix was to replace both micro-switches with equivalents as the originals are no longer made by Cherry. The closest I have found so far are Omron D2HW-A211D sub-miniature micro-switch with lever. The body is slightly shorter but the height is the same (vital) and the contact spacing and operating zones are equivalent as is the contact arrangement of Common, NO and NC (normally open, normally closed). My fix cost a total of 1.94 GBP (approx $2.50 currently) and took 20 minutes to remove plus 30 minutes to re-fit (a two man job makes it so much easier). A small mod is required to the switch to bevel the end of the lever so that it does not get fouled on the plastic operating cam of the switch. A pair of pliers will do this easily. 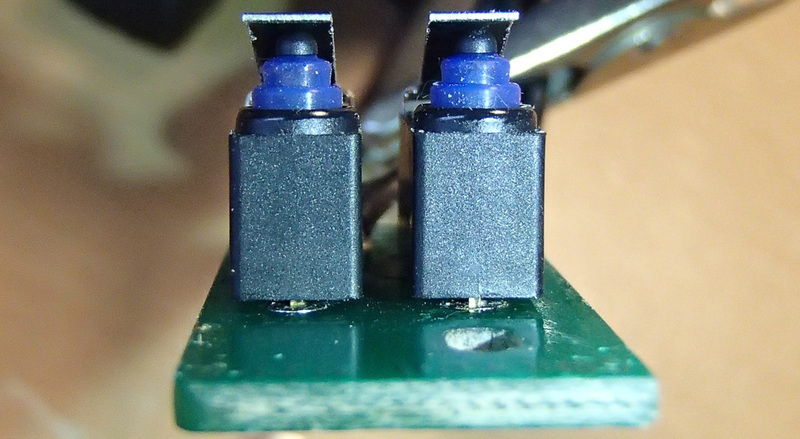 When re-soldering it is important to ensure that the switches are perpendicular to the PCB and at the same height so they actuate together as closely as possible. It will never be perfect as there is some operating tolerance in the switches and the plastic operating cam may not wear evenly but my theory is that there is a timing tolerance built in to the ECM firmware to handle this. Always re-flow the wire connections of course and since as we all know these assemblies are difficult to re-fit if you ever remove it for any reason (even if you see genuine dry joints) it is always prudent to replace the switches anyway as their service life seems to be well less then the life of an XK8. For the same reason, buying replacements from breakers is usually a false economy as you could be buying one whose micro-switches only have a few thousand miles left in them - remember only one has to fail or go intermittent and determining which one it is with a multi-meter is doomed to failure unless it has failed completely (unlikely). Attached a few pics which I hope will help of (in order) before and after the mod, the fitted replacements on the PCB, the plan view end on and one of the originals for reference. 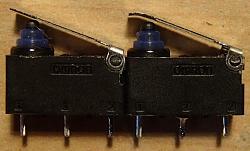 Finally, be careful buying micro-switches 'specially for XK8 brake switch replacement' off eBay, all the ones I have seen so far are not sealed (a shroud around the pin) and seem too short which means the lever is not close enough to the cam to operate as designed although you might get away with it. They are also darned expensive on eBay here (20 GBP the pair, approx $25 currently - daylight robbery). Last edited by jima; 11-27-2016 at 06:38 PM. Thanks for your reply. Very interesting because the one I got on e-bay is a plastic integrated housing. I assumed it is a newer style because it is a Jaguar part. I saw a used older one listed with the micro switch on a metal bracket, but I opted for the new supposed Jaguar replacement. Cant say I love working under the dash while standing on my head. Thanks! I just found yesterday's post on the thread about this problem and its fix, while browsing 'Today's Posts' and how lucky I am! I've only had my '06 XK8 coupe a few weeks and just today first got this pair of messages while driving over the mountains to Mendocino. I am not looking forward to this project but at least now I know what to do. This forum rocks! What did you have to pay for the switch Burl? Best price I could find for supposedly genuine part P/N: 17922.LJB6420BB was $160 from AutohausAZ. Love to see a pic of that, Burl, or a link. I bribed one of my sons who is a bit more limber and has slightly smaller hands with a sausage sandwich breakfast to help lol. Best position we have found to date is kneeling by the side of the car on a pillow for knee protection using the left hand to reach up and under. We have never found it productive to try to see what is going on, best to close eyes and feel the way while the other looks from in the bonnet topside to as a spotter for the studs to give guidance and the minute a few threads poke through get a nut on a stud quickly (attached to the end of a long barbecue skewer with a bit of Blu-tack). The other trouble maker is the cable which, in the standard position, will likely foul the dash housing and prevent pushing the switch assembly far enough up for threads to poke through. Dress it so it flows out from under the switch so it is out of the way. Do remember to start the engine for servo-assist and use a long stick between seat and brake pedal to force it fully down which will move the actuating pin out of the way. I use a photographer's mono-pod which is nicely adjustable and blunt enough not to damage seats. All this probably in other guides but no harm to mention again. Good luck! Advance has it for much less under "Cruise Control Switch". Big discount today, too ($95 then %25 off). Last edited by fmertz; 11-28-2016 at 02:26 PM. Sorry. I later looked at your post again and saw the link. Followed it and found the switch. Appears to be correct switch but appears not to include the bracket. Last edited by 150FHC; 11-28-2016 at 04:26 PM. Reason: Discovered answer I sought.